C&M Conveyor’s Mesh Ball (MBC) Rotation Conveyor provides a rollerless surface that utilizes a durable Modular Ball-Belt and integrated bearing-mounted, worm gear driven rotational disc to rotate single/multiple stacks of material with and without dunnage. The MBC Rotator has the ability to rotate clockwise or counter-clockwise. 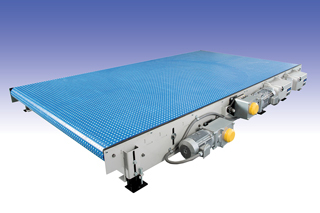 With few moving parts and no pneumatics, your load rotation operations will benefit from the low maintenance of this device. C&M’s MBC Rotator features all-welded precision laser cut and formed steel-frame construction. Our MBC Rotator requires no adjustment in the field. Units are fully assembled and tested before leaving C&M’s manufacturing facility. C&M’s MBC Rotator can be utilized in many locations for the rotation of unit loads, stacks of material for cross-corrugation, or zero trim applications in a modern box plant. The device is capable of rotating multiple stacks of material simultaneously, without disrupting stack integrity.